Large enterprises have been using intelligent virtual agents for years. Use of IVAs can result in profound cost savings, increased sales and customer loyalty to simply the entertainment of having a robotic presence on a website. In fact, the number of organizations adding this capability is growing by 20 percent per year, especially in travel, consumer goods, telecommunications and banking. According to Gartner by 2015, 50 percent of online customer self-service search activities will be via a virtual assistant at least 1,500 large enterprises. The benefits of intelligent virtual agents are undeniable. However, SMEs have not been able to take advantage of this technology due to high costs and complexity of implementations. At ViClone we spent nearly two years creating an intelligent virtual agents for SMEs. One that it is affordable, easy to deploy, setup and maintain. SMEs need this type of technology more than large enterprises that can take advantage of a multitude of other sales and support channels to reach their potential and existing clients. Whereas, SMEs and startups are often unable to deliver adequate customer service due to the excessive monetary and human costs of providing a true around-the-clock customer service and support. Previous economic revolutions gave us the tools to make, buy, move and sell things. Technology now removes time, location and scale as factors. viCloning, intelligent virtual agents, allow SMEs to do more with less. viCloning is affordable. It costs the same as a typical live chat solution but without the hidden human and monetary cost, or the tremendous opportunity cost of splitting your time between running your business and providing customer support. viCloning is simple. It doesn’t require IT skills, and only takes five minutes to setup. It is the first intelligent virtual agent solution that can be easily self-managed. 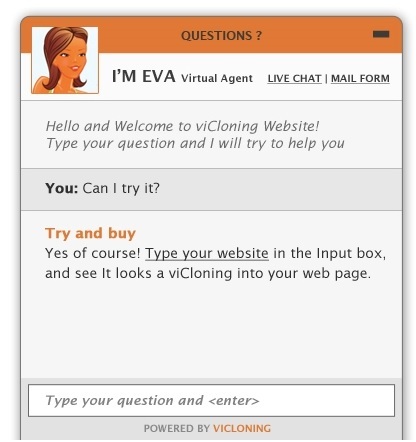 viCloning uses an advanced natural language engine to understand the meaning of the question. It is the first intelligent virtual agent with automatic self-learning and a user-friendly, proactive trainer. It can support more than 35 languages ensuring that no matter what language a customer speaks, it will be understood. viCloning doesn’t sleep, go to lunch or on vacation. It is the only true 24/7/365 customer service and support solution that delivers a consistent level of service. The old rule of “If we react within 24 hours, we are doing an amazing job” is obsolete! Customers expect an answer within four hours at most. viCloning answers instantly while filtering customer queries that really demand your attention. The questions customers ask, and how they ask them, are an invaluable insight. viCloning provides real-time comprehensive analysis and customer intelligence tools which allow companies to understand their customers better than ever before. viCloning is incredibly scalable and can easily grow with companies as they transform from a humble start-up to a large corporation.